^ Griffiths, Ieuan L. l (17 June 2013). The Atlas of African Affairs. Routledge. ISBN 978-1-135-85552-9. ^ a b Oliver, John E. (23 April 2008). Encyclopedia of World Climatology. Springer Science & Business Media. ISBN 978-1-4020-3264-6. ^ a b c Nicholson, Sharon E. (27 October 2011). Dryland Climatology. Cambridge University Press. ISBN 978-1-139-50024-1. ^ a b c Houérou, Henry N. (10 December 2008). Bioclimatology and Biogeography of Africa. Springer Science & Business Media. ISBN 978-3-540-85192-9. ^ Brown, G.W. (17 September 2013). 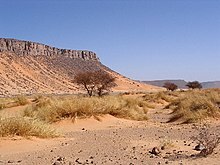 Desert Biology: Special Topics on the Physical and Biological Aspects of Arid Regions. Elsevier. ISBN 978-1-4832-1663-8. ^ Boissoneault, Lorraine (24 March 2017). "What Really Turned the Sahara Desert From a Green Oasis Into a Wasteland?". Smithsonian. Retrieved 15 August 2017. ^ Vaks, Anton; Bar-Matthews, Miryam; Ayalon, Avner; Matthews, Alan; Halicz, Ludwik; Frumkin, Amos (2007). "Desert speleothems reveal climatic window for African exodus of early modern humans" (PDF). Geology. 35 (9): 831. Bibcode:2007Geo....35..831V. doi:10.1130/G23794A.1. Archived from the original (PDF) on 21 July 2011. ^ Adams, Jonathan. "Africa during the last 150,000 years". Environmental Sciences Division, ORNL Oak Ridge National Laboratory. Archived from the original on 1 May 2006. ^ "Acinonyx jubatus ssp. 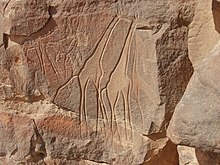 hecki (Northwest African Cheetah, Saharan Cheetah)". oldredlist.iucnredlist.org. Retrieved 23 October 2018. 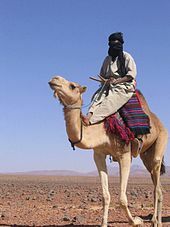 ^ a b "Stone Age Graveyard Reveals Lifestyles Of A 'Green Sahara'". Science Daily. 15 August 2008. Retrieved 15 August 2008. ^ a b Wilford, John Noble (14 August 2008). 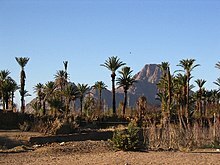 "Graves Found From Sahara's Green Period". New York Times. Retrieved 15 August 2008. ^ Schultz, Nora (14 August 2008). 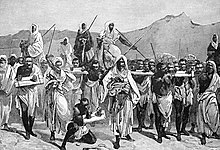 "Stone Age mass graves reveal green Sahara". New Scientist. Retrieved 15 August 2008.